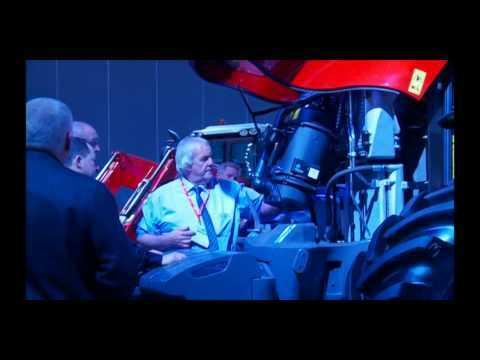 Machinery manufacturer AGCO recently unveiled an array of new Massey Ferguson products under its Vision of the Future banner at the Melbourne Convention and Exhibition Centre. With almost 300 guests in attendance including dealers and distributors from Australia, New Zealand and Far East Asia, the new product releases coincide with the Company’s new global strategy, which now makes available six new tractor models with more to follow in the near future. Resulting from a $375 million investment in a new state-of–the-art production facility and five years of research and planning, the all-new Massey Ferguson Global Series utility tractors span 60hp - 82hp and are available in varying configurations and specification levels. The new range took pride of place on the big stage at the event’s opening Gala Dinner when the curtains were hoisted, revealing the complete Massey Ferguson product range featuring close to 80 units on display in the 4500sqm venue. Dealers and distributors from the APAC region were then taken through extensive product training sessions over two days including drive sessions held at the Werribee Equestrian Centre. The MF2709, MF4707 and MF4708 are the first new models in a ground-breaking new 60hp to 135hp global family. “The Global Series tractors are significant because for the first time in 20 years, AGCO has taken a "clean sheet" approach to the design and manufacture of the machines, states Gary Collar, AGCO’s Senior Vice President for the APAC region. The series reflects the Massey Ferguson heritage of success in the utility tractor sector, which is based on dependability and reliability and is purpose-built for modern applications across international markets. We’ve also tested the new range in brutal conditions from Arizona in the USA to Lusaka in Zambia,” says Gary. Developed by Massey Ferguson engineers in Beauvais, France, more than 90% of the parts and components in the Global Series are entirely new - designed and engineered specifically for the tractors. Making it all possible is AGCO’s new state-of-the-art factory built in Changzhou, China which when fully operational will not only manufacture the Massey Ferguson Global Series but also function as a logistics hub for spare parts and components. Developed and constructed in three phases, AGCO has invested over $375 million in the 190,000 square metre facility, which incorporates a further 30,000 square metres for expansion. “The facility utilises the most modern manufacturing equipment and principles, making it one of the most technologically advanced factories in the world, states Gary. The Changzhou factory is capable of building any machine or part AGCO requires to the highest worldwide standards."